In 1964, the Pennsylvania Department of Transportation (PennDOT) relocated a portion of Tipton Run to accommodate a new roadway (SR 4021) and associated bridge. Severe storms in 2004 and 2006 began a destabilization process, in which the banks on the outside of a bend upstream of the bridge began to severely erode causing sediment to accumulate underneath the bridge. The U.S. Fish and Wildlife Service (USFWS), PennDOT, and Wildlife for Everyone Foundation (WFEEF) collaborated to develop and implement a stream restoration project to restore this section of Tipton Run. The USFWS provided planning, design, and construction expertise, PennDOT provided funding for the project, and the WFEEF provided financial management services. The goal of the restoration project was to bring the channel to more appropriate dimensions, thereby improving sediment transport under the bridge, and to minimize bank erosion and enhance the aquatic habitat by installing multi-functional in-stream vane structures. The project is located near the town of Tipton, PA, on SR 4021. Tipton Run was eroding the stream bank just upstream of the bridge, and was actively meandering to the river left side. The landowner on this side of the stream lost approximately 10-20 feet of the bank, along with most of the trees and shrubs along this section. A detailed stream channel survey was conducted on the impacted portion in 2006, along with a characterization study of a stable reach upstream. Both surveyed reaches were used to develop the restoration plan that was successfully implemented in the summer of 2007. Approximately 950 feet of stream channel were restored. The restoration project included: construction of bankfull benches to narrow the channel to its proper width, and construction of five rock vanes and two log vanes to direct high-velocity stream flow away from the banks. The placement of some of the structures was adjusted to preserve existing riparian trees and vegetation, thereby preventing additional destabilization of the stream bank in those areas. This project has multiple benefits: decreasing sediment accumulation around the bridge, decreasing bank erosion, thereby protecting property, and improving aquatic habitat. The improved sediment transport capacity will reduce the amount of fine sediment in the stream bed, making the stream more conducive for fish reproduction. The rock and log structures provide areas of habitat for many aquatic species. Significant improvement is anticipated in regards to the ecological functions of this portion of the stream. Before: A cutoff channel had formed, and was eroding the yard to the right. Excess sediment in the stream was reducing aquatic life. After: The channel was consolidated and narrowed with bankfull benches; the new banks were then protected with rock and log structures. Riparian plantings will protect band and enhance wildlife habitat. Canoe Creek is a High Quality Cold Water Fishery which runs through Canoe Creek State Park before entering the Frankstown Branch of the Juniata River. 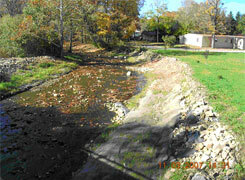 At the project location, the stream is bordered by an abandoned railroad grade currently utilized by hikers and horses. The river right bank showed signs of erosion due to low vegetation as a direct result of trail maintenance practices. 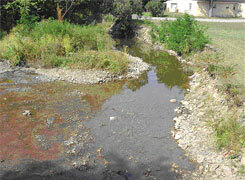 Over time, a portion of the stream had become severely eroded; causing sediment and gravel to wash from the existing stream banks and build up downstream. This condition not only created a chronic problem with bank degradation, but also placed stress on the aquatic community and limited the reproductive capacity of fish populations. The U.S. Fish and Wildlife Service (USFWS), Pennsylvania Department of Transportation (PENNDOT), and the Wildlife for Everyone Foundation (WFEEF) collaborated to develop and implement a stream restoration plan for this site. The goal of the restoration project was to restore the stream channel to more natural dimensions, and install a structure that would minimize bank erosion and enhance the aquatic habitat. The USFWS provided planning, design, and construction expertise, PENNDOT obtained the permits and provided materials, and WFEEF provided financial management services. Once the proper channel dimensions were established for the stream, a 110-foot long mudsill was constructed on the outside curve on river right, following specifications by the PA Fish and Boat Commission. It was built using a combination of logs and 15-foot decking, installed perpendicular to the stream flow, and extending out over the water three to four feet. Soil and gravel lifts were placed on top of the structure to create an overhanging bank, which was stabilized with seed and mulch. The sill logs serve to slow water velocities next to the bank, and the overhanging bank provides ideal habitat for fish and other aquatic species. This project has multiple benefits which include decreasing erosion, thus significantly stabilizing the banks; and improving the aquatic habitat by providing a more natural and healthy stream channel. Reduced erosion in the stream makes it more conducive to fish reproduction and the mudsill provides areas of habitat for many aquatic species. Significant improvement is anticipated in regards to the ecological functions of this portion of the stream restoring more natural flow to create a flourishing ecosystem.